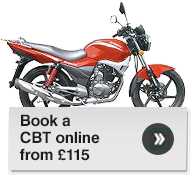 Learner riders must complete a CBT before riding on the road*. ADS carry out CBTs on Government approved sites and only use instructors who have been assessed by the Driving Standards Agency. The course is broken down into five elements. The first four take place on safe, off-road sites while the final element puts theory and training into practice on the road. When you and our instructor are confident of your riding ability you will be issued with a CBT certificate (DL196). The instructor will de-brief you following your road-ride highlighting any areas of weakness while praising your stronger points. ADS ensure that your CBT is an enjoyable day with an opportunity to meet like-minded people. A CBT certificate is valid for 2 years from date of issue after which you must re-take it if you haven’t obtained a Restricted or Full licence in the meantime.